The Brushtail possum has adapted extremely well to living in suburbia - in fact often sharing our homes with us - quite often closer than you think! Many customers tell me they hear fighting, growling, heavy breathing and thumping throughout the night in the roof. Most people believe possums live in trees - well I’m sorry to say they don’t, unless you have a hollow tree in your garden. Which most of us don’t. So possums must reside elsewhere! Possums are very intelligent animals, they can find the most obscure hole in your roof, because possums have been born and bred in roofs it is their natural sense to look for holes to live indoors rather than outside. The wall of your house is the equivalent of a hollow tree to the possum. So what we must do is create hollow trees for them to live in. Possum Boxes are the answer. I have been installing these boxes for 10 years now and have a good success rate of possum occupancy. So the injured possum you have dumped will try to come back home, they have great homing instincts and can travel 10km in a single night. He will start crossing the roads rather than go through the trees, these are the ones we pick up off the roads, usually after being hit by a car. We know this because of the trap nose the possums have. The possum is also fighting other possums as he/she is crossing a different territory, that is when you may have a fight in your roof, the resident possum is defending his territory. That is the fighting we hear at night. When you trap and take away the possums you are also splitting the family groups up. So what we have been doing to the possums over the years has been upsetting the balance of them. We need to learn to live with them, and not against them. Relocating possums is both illegal and inhumane. It is illegal to handle or interfere with possums except when they are in your roof, or other buildings. Trapped possums must be released that day on the same property, in their own territory, within 50 metres of the capture site. Possums may be taken to vets to be killed humanely. These are the only two legal ways to deal with possums otherwise penalties up to $5000. For the reasons above, that is why l don’t trap in cages. What l do is, what we call night blocking. When the possums are out in the trees at night l come and lock them outside of your roof. This way we normally remove all possums in the one night very quietly so you don’t hear them crashing the traps in the roof all night long, and the possums don’t end up with trap nose. The possums will try to get back into the roof in the morning, so you may hear them outside, but it won’t be the same noises you were used too. So the only distress l cause the possum is that they can’t get back into their home. This is why it is important to have the nest boxes in the trees. Rats are a problem around Melbourne The numbers you can have in your area, all depends on the amount of food available to them. They love snails, pips from plum trees, walnuts, almonds, and small bones all these things l have found in many roofs around Melbourne, at times l can bring bucket loads from roofs, that has accumulated over the years. Bird nests can attract rats, they like to raid the nests to get the eggs from them and seeds from the nest material. Possum droppings are also a good food source for rats. Prevention is always better than cure, so what we recommend is to cut their access to the roof. Trim all trees from the roofline. Block all holes around building. Clear any rubbish off the property. To bait the roof area. If you follow these step you will greatly reduce the chance of rats getting into your property. It is always difficult to give a guarantee that rats cannot gain entry to your roof, because of all the different areas that they can get into, but the more you seal the less chance of them getting in. Baiting your roof is the best protection you can give yourself against rats. When the baiting is done what will happen is the rats will send 1 or 2 to go and test the bait, if they become ill they will tell the others not to feed on the bait. That is why we use bait that is a single dose bait, one feed kills, with a delayed mode of action. No affect on them for 2-3 days. So what happens is they all come and feed on the bait without associating it with poison. This is normally 3-4 days after the bait is laid down. You may hear more noise in the roof over this time. I call it ”party time.” It gives you an idea of how many are in your roof at the time by the amount of noise you may hear in the roof at night. Once they all have come and feed, 5 days down the track they will start to die. They will head for water, so they generally don’t die inside the roof, unless you have a water supply for them in there. That is why we recommend keeping the gutters clean on the roof and the water flowing down the pipes. 7-10 days after the baiting is done the rat’s noises you once heard will be gone. Until the next lot come and move in. But they will go straight to the bait and then go through the same process as described above and disappear. If you happen to find any dead rats outside, burying them is the best way of disposing them. Don’t put them in the rubbish, where non-target animals can get them at the tip. You will at some stage have more rats back in the roof area, don’t worry because there is plenty of bait left in the roof for the new ones to feed on and go through the same process as described above. If one dies in your roof you will smell it. That is when you ring me and we attend to remove the dead rat. One free visit to remove any dead from roof area comes part of all rat jobs. If any further information is required, please don’t hesitate to phone me anytime. Why choose Nigel's Animal Rescue. Nigel's Animal Rescue are the experts when it comes to animal rescue, removal and rehousing. With over 25 years combined experience, we have the tools and the know-how to rescue, remove and re-house almost any animal in almost any situation. Using Nigel's Animal Rescue will ensure the best long term results for both you and the animal in question. There are many and varied factors to consider in animal rescue and removal. Nigel's Animal Rescue always use the appropriate methods to minimise animal discomfort, reduce the risk of the problem reoccurring and ensure you avoid any legal ramifications due to mishandling or mistreating animals. DON'T RISK IT! Trust Nigel's Animal Rescue for all your animal rescue, removal and rehousing needs. Q: What would be your most common rescue? A: Possums and Birds stuck down chimneys are the most common rescues Nigel's Animal Rescue perform. Brush Tail Possums tend to get stuck after assuming they can gain access to the ceiling via the chimney. Indian Minor Birds tend to use the chimney as a hollow to build their nest in. Q: What would be your most unusual rescue? A: Nigel's Animal Rescue attend many strange rescue situations such as a Wombat trapped down a mine shaft and a horse in a swimming pool. Our most involved rescue would have to be that of a Lace Monitor (a large native lizard) which was stuck up a power pole. 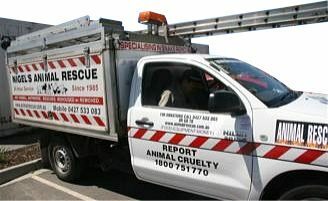 For safety we had to get the power company to turn the power off while we rescued the animal with a cherry picker. Donations of equipment such as old towels and blankets, cages, feed and many other items greatly assist us in providing the best service at the lowest cost. Your donations are hugely appreciated. Medical, Animal feed such as bird seed, cat food, animal milk such as Di-Vetelact (used for raising orphaned animals) etc. All money donations go towards rescue, rehabilitation, vet cost and the building of a new wildlife shelter. If you would like to donate please call Nigel on 0427 533 083 or email nigel@animalrescue.com.au.